Two years had passed since the Woodsboro murders. Sidney Prescott (Neve Campbell) was now in college majoring in drama, Gale Weathers (Courteney Cox) became a best-selling author, and a movie known as “Stab,” inspired by the aforementioned killing spree, had just been released. But when a couple (Jada Pinkett Smith, Omar Epps) was murdered during one of its screenings, Dewey (David Arquette) quickly, despite the limp, ran to Sidney’s protection and movie geek Randy (Jamie Kennedy) was present to explain the rules of horror sequels. Written by Kevin Williamson and directed by Wes Craven, “Scream 2” was able to defy the odds by pointing its fingers on bad scary movie follow-ups without being one itself. The film worked on multiple levels because it had more than one joke that worked. For instance, it acknowledged the idea that horror pictures seemed to be lacking in African-American characters and other minorities. Aside from the doomed couple in the memorable first scene, we knew the joke made a lasting impression when a minority was randomly placed next to one of the main characters and we couldn’t help but chuckle. However, it didn’t feel forced because the story took place in college. While the murder scenes were less creative–but more gory and elaborate as Randy stated–than its predecessor, they retained a level of cheekiness, especially when Sarah Michelle Gellar was given the chance to shine as the “sober sorority sister,” so it was fun to watch. We knew that her decision to go upstairs, as we learned in the first film, was a very bad idea but she did anyway. Downstairs, it seemed like she knew how to defend herself so maybe, despite being blonde and pretty, she would be lucky enough to escape. But it wasn’t just about murders on campus. Cotton Weary (Liev Schreiber), the man Sidney wrongly accused of killing her mother, had just been released from prison. The fact that he had motive to take bloody revenge and his thirst for fame warranted serious suspicion. It was a reminder that we couldn’t always trust Sidney’s judgment which was a small twist from typical slasher flicks where we take comfort in the virgin making all the right decisions to make it to the very end. The film spent more time on the characters and worked on the undeveloped strands from the first installment. What remained the same was everyone was a suspect. From Sidney’s pre-med boyfriend (Jerry O’Connell) and sassy friend (Elise Neal), Randy’s movie-loving classmates (Timothy Olyphant), to the reporter (Laurie Metcalf) desperate for the latest scoop. 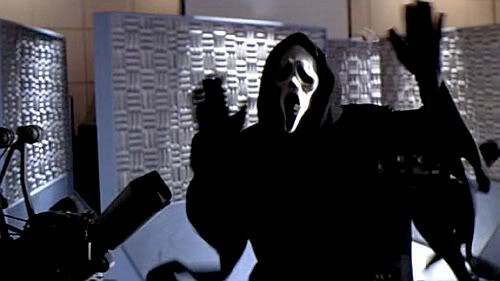 “Scream 2” was a vat of self-awareness; I relished every witty line and irony within an irony. Most impressive was sometimes the joke and horror came hand-in-hand.